In our Children Worship! study, we are learning how worship serves as a conversation by provid-ing a time for us to talk with, listen to, and respond to God. Most recently, we have been studying how the different prayers used in worship contribute to and guide us in this ongoing dialogue. The time spent in prayer during worship is, however, actually more than our recitation of a written prayer or our pause to listen to the prayers offered by our pastor or others on behalf of the congregation. In fact, if we were to look closely at our order of worship, we would find that there are often other “times of prayer.” For example, when the people of God praise and thank God through music or responsive reading, these are voiced or sung prayers. Likewise, times of confession as well as opportunities to reflect on and petition God for personal needs or intercede (by spoken prayer or loving action) for the needs of others can also be times of prayer. 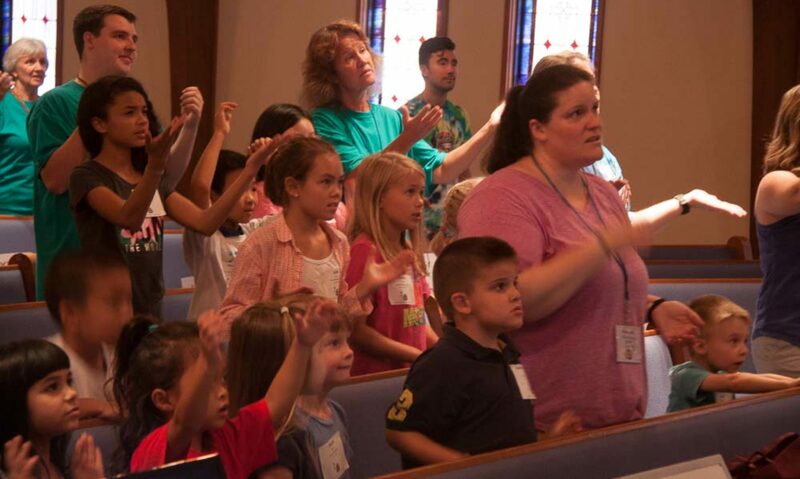 For children to grow in their ability to participate in worship, though, they need to recognize the language of prayer and its many postures. Words used in and about prayer, such as praise, thanksgiving, intercession, confession, forgiveness, lament, and amen (which means “so be it”), are important for children to know and understand. Taking the time to help the children we know learn this language of prayer helps children feel more comfortable in using and hearing the words, and, in turn, helps provide them with a sense of belonging. Remember, too, that when we pray we also have the opportunity to use postures of prayer to show our relationship with God. Often, we bow our heads to show honor and reverence. Sometimes, people lift their head or hands to show their awe and wonder or they kneel to show obedience. Some pray with their eyes closed to focus solely on God while others pray with their eyes open to notice God’s wonderful world and the people who need God’s love and care. How many postures of prayer do you use during the worship service or during your own times of personal and private prayer? Encourage children to pray in ways that show their relationship with God. We have been reminded again in recent days that we live in a world filled with darkness and evil. The horrific shooting at Marjory Stoneman Douglas High School in Parkland, FL, has confronted us at the beginning of Lent with grief, heartbreak, and anger. These tragic events seem to come around so often that it is difficult to find appropriate words that offer hope and comfort without sounding like pious platitudes or empty promises. Added to the pain and shock of the event itself, the angry voices disagreeing vehemently over proper solutions to the challenges of our culture can make many of us feel overwhelmed and discouraged. There are many levels and layers to the problems, and I keep wondering how we can move forward when it seems impossible to have difficult conversations with a commitment to listen to and love those who are different than we are. It strikes me, however, that Lent is an appropriate time to recognize and acknowledge the reality of our struggles, our anxieties, and our brokenness. During this season, we remember that when Jesus came into the world, He was not received by all with open arms and gracious hospitality. He was often failed by those closest to Him and was rejected by those with power and prestige. Even in the face of struggle, though, He chose to love the broken world and the needy people within it so much that He gave up His own life so that we might live more abundantly. Abundant life, however, does not mean that we get to escape the struggles of the world. We are called to be salt and light in the world, continuing the work of Jesus. I was recently in a group that included a firefighter. In the midst of the conversation, this young firefighter said, “While you all are running away from the fire, we are running toward it.” While I have heard similar statements before, it struck me that this is the call of the church to our world. Even as many are blaming and attacking and promoting division, we are called to move into the darkness and pain with love that shows grace and invites healing. We must use our voices and offer our lives to serving and loving others. We are inviting you to consider during Lent how you might show acts of love towards God and towards others. Some have written down a commitment and placed it on the cross in the sanctuary. Let us commit ourselves to prayer and study that moves us toward Christlikeness, and I encourage all of us to seek God’s leading so that we can move into the world with acts of love and mercy as the hands and feet of Jesus. What are the tangible ways God might be calling you to build bridges and offer compassion? In the wilderness of life and Lent, how might God use you to offer hope? May this be a season in which we grow in our commitment to following the example of Jesus.